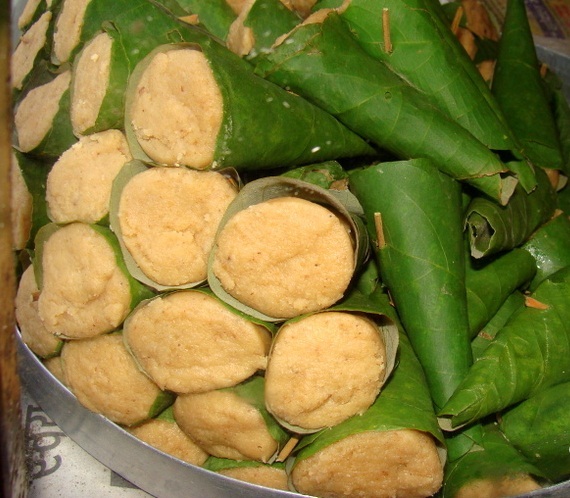 Singori: Singori (also spelled Singodi) or Singauri is an Indian sweet made with Khoya and wrapped in maalu leaf. It is similar to Kalakhand. It is an exquisite cuisine of Kumaonis, a community inhabiting the region of Kumaon in the north-eastern section of the state of Uttarakhand. The region has its own distinct, impressive culture and delicious, nutritious, tasty dishes. 150 gms fresh grated coconut. 20 molu leaves, folded into cones. 2 tbsp fresh rose petals. Smash the khoya on a flat surface till it becomes smooth. Mix the khoya with cane sugar in a pan. Cook the khoya-sugar mixture for about 10 minutes or till the khoya melts. Add in the fresh grated coconut. Let the khoya mixture cool down to the room temperature. Divide the khoya mixture into 20 equal balls. Transfer each khoya ball to each molu leaf. Decorate the cone with fresh washed rose petal. Singori are ready to be served. Serve singori with a spoon and enjoy this very traditional dessert recipe right at your home from Kumaon hills of Uttarakhand in India. If you have any queries regarding the Singori recipe, please leave a comment.